This report provides an update on the Grant County economy incorporating current, not seasonally adjusted, nonfarm employment and civilian labor force data. Analysis focuses on year-over-year (between the Marches of 2014 and 2015) and average annual (between 2013 and 2014) labor market changes. Preliminary labor force data show that Washington state’s average annual not seasonally adjusted unemployment rate decreased eight-tenths of a percentage point between 2013 and 2014, from 7.0 percent to 6.2 percent. Between the Marches of 2014 and 2015 the rate declined one and one-tenths points, from 6.8 to 5.7 percent. In Grant County, the average annual unemployment rate decreased one and one-tenths percentage points between 2013 and 2014, from 8.8 to 7.7 percent. The rate decreased one and one-tenths points this March to 8.1 percent from the 9.2 percent reading in March 2014 (see Figure 1) as the number of unemployed residents dropped and the labor force expanded (see Figure 3). Figure 1. 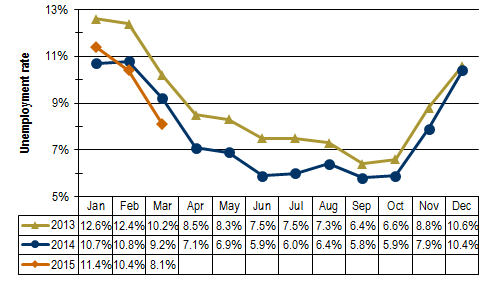 The Grant County unemployment rate decrased from 9.2 percent in March 2014 to 8.1 percent in March 2015. This analysis of Chelan and Douglas counties incorporates not seasonally adjusted, nonfarm employment and civilian labor force data. Analysis focuses on year-over-year (between March 2014 and March 2015) and average annual (between 2013 and 2014) changes in the labor market. In the two counties, the annual average unemployment rate fell from 7.2 to 6.6 percent between 2013 and 2014, a six-tenths percentage point drop. 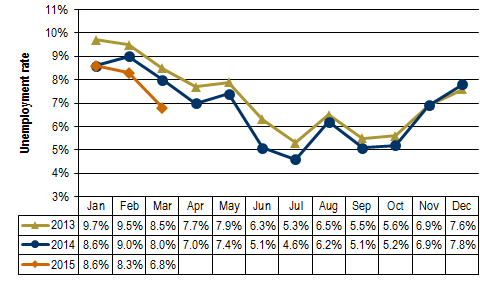 The rate decreased one and two-tenths percentage points this March to 6.8 percent from 8.0 percent reading in March 2014 (see Figure 1) as the number of unemployed residents contracted and the labor force expanded (see Figure 3). Figure 1. The unemployment rate in Chelan and Douglas counties decreased one and two-tenths percentage points between March 2014 and March 2015.